Rousse in the 75 ml bell jar. 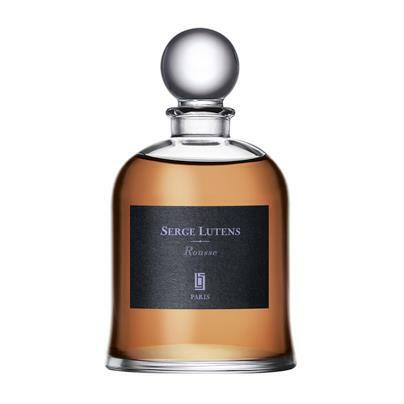 It can be a foolish thing to enter into a perfume with set expectations when it is a Serge Lutens. Not only do you never know where he’s going to take you, but you also never know the damn notes in the perfume. So, I shouldn’t have been surprised to have an unexpected ride with Rousse, but, nevertheless, I am. I went into the test knowing Rousse was a cinnamon perfume that is consistently compared to the aroma of Red Hots, the spicy, fiery cinnamon candy. Somehow, I expected to think of famous, strong redheads who would probably have epitomized Rousse, whether Elizabeth I or Christina Hendricks of Mad Men fame. Nope. None of it. Instead, I had what seems to be a slightly atypical experience, which probably explains why I can’t decide if I think Rousse is a strange fragrance, or a pleasant, but underwhelming, one. In the end, I think I’ll lump the two things together: Rousse is a slightly strange fragrance with some really pretty parts — but I wouldn’t be disappointed if I never smelled it again. The old, discontinued 50 ml bottle of Rousse. Ad source: Lutens Facebook page. Rousse was created by Christopher Sheldrake for Serge Lutens and released in 2007 as one of the regular Import line that is available worldwide. Later, perhaps because of the public’s seemingly lackluster response to the fragrance, Rousse was pulled from regular distribution, discontinued in its small 1.7 oz/50 ml bottle size, and limited to the Paris Exclusives bell jar line. (That said, some of the old, cheaper bottles are still available for purchase at discounted rates online.) I’ve noticed the Bell Jar fragrances are often the more complicated, thorny, or unusual fragrances that aren’t quite as approachable or popular as the regular line with its Chergui, Ambre Sultan, Un Bois Vanillé, citrus florals, and the like. Rousse isn’t complicated or difficult, by any means, but it seems to have suffered from the critical response. And, as you will see, Rousse doesn’t always turn out as expected on people’s skin. Rousse is an elegant, sparkling, sweet and sensual skin scent. Serge Lutens’ inspiration for Rousse came from childhood memories of grandma baking and making jam. Rousse highlights cinnamon, ‘spicy, almost prickly, as though it were composed of miniscule starbursts’. A spice that’s also a tree bark that ‘remains singular, though it shades from beige to reddish-brown’: ‘an imaginary cinnamon (…) that wants to hold onto an image of the color of her hair, weaving it into a spice that is so often overlooked’. mandarin, cinnamon, cinnamon wood, cloves, spices, floral & aromatic notes, fruit, precious woods, amber, musk and vanilla. One of those generalized, undefined categories on the list ends up being quite important because, on my skin, Rousse is not a fragrance that is simply about fiery Red Hot cinnamon sweets or cinnamon spice. Far from it. Rousse opens first and foremost with white floral notes that have a very peculiar, grey, soapy tinge, and which are mixed with a bitter, pungent, slightly medicinal note of cloves. Quickly, they are joined by orange tones, dry spices, and dry woods. Both the combination of notes, and the way that their slightly acrid, sharp overtones burn my nose momentarily makes me think of Lubin‘s Idole in eau de toilette form. It takes about a minute for the cinnamon in Rousse to appear but, when it does, it bursts forth with such intensity that Rousse is briefly transformed into the expected Red Hots candies, and very little else. The fiery sweets sit atop a somewhat thin, lightly boozy element mixed with that strange, dry, grey-white note that appeared earlier. I’ll simply call it a “greige” note, because that’s what it feels like, especially as there is the quiet whisper of something soapy underneath. The Red Hots blast remains for all of about three minutes, and then, Rousse returns to smelling primarily of that surprising floral bouquet. I struggled with it at first. Magnolia? Linden? Magnolia and linden? Less than 15 minutes into Rousse’s development, it definitely felt like linden. The note is white, honeyed, and similar to honeysuckle, but with a sprinkling of lemon blossoms and a soapy, clean undertone. Linden is Rousse’s primary note on my skin for a good portion of its beginning, and I find that to be incredibly surprising. Ten minutes in, Rousse is a swirl of lightly spiced florals. There is honeyed linden with its soapy edge, flickers of mandarin orange in the far distance, and a quiet touch of cinnamon red hots, all over a base of somewhat abstract, dry woods. The cinnamon has receded from its initial power at the opening to something much more balanced. It melts into the linden, feeling quite indistinct in any concrete, substantial form, and merely adding a lightly spicy kick to the honeyed flower. The mandarin orange note in the back is quite disappointing. It’s muted, mild, almost evanescent except as an occasional pop-up. It never feels very juicy or even candied but, rather, something dry. It’s hard to tell because it’s wholly lacking in both character and weight. Much more noticeable, however, is the slow stirrings of a light musk that starts to swirl around the linden. Rousse doesn’t twist and turn very much, especially as compared to most Lutens fragrances. At the end of the first hour, it is still primarily a floral scent on my skin. 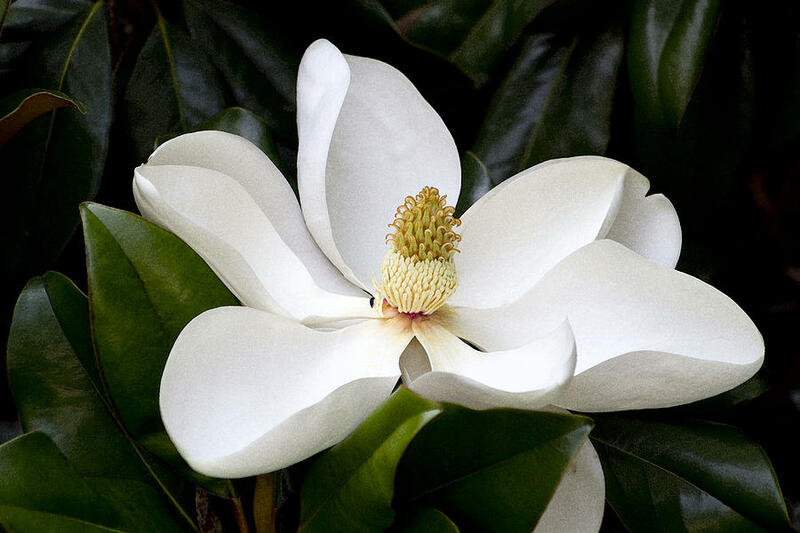 However, there is a sudden creaminess that adds richness and a velvety undertone to the flowers, and, once again, I think of magnolia as a counterpart to the linden. That impression continues as Rousse develops, and I really wonder if magnolia is one of the hidden notes. Others have detected a similar buttery floral note, but think it’s orris butter. On my skin, the note lacks the powdery nuances of orris, but who knows. 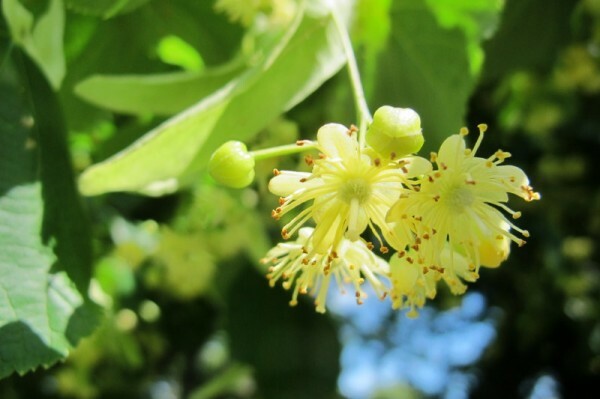 Whatever it is, the creamy flower is strongly intertwined with the linden, thereby impacting the latter and changing it as a result. The linden still feels very honeyed and tinged by lemon blossom, but its rather soapy undertone weakens substantially. Yet, Rousse never feels like a purely floral fragrance, thanks to the dried, somewhat smoky, wood notes in the base. Oddly enough, however, the cinnamon seems to have retreated to just a bare shadow of its former self, and now skulks around in the background. On top of it all, the whole fragrance has dropped in sillage to hover just a scant inch above the skin. Rousse never had powerful projection to begin with, and Ozmoz describes it as a “skin scent,” so it’s clearly meant to be quiet and discreet in nature. Around the 90 minute mark, Rousse is a magnolia-linden concoction on my skin with a subtle fruity nuance, flickers of dried orange, abstract spices, and amorphous dry woods. The latter smells a bit smoky, a little bit bitter, and just barely tinged by cinnamon and cedar. To be honest, the wood element is both odd and unusual, and for some reason, calls to mind, again, Idole with its ebony wood and what Luca Turin described as grey flotsam driftwood. Something in Rousse’s woodsy combination feels quite similar, though the accord is too muted, too hidden, and too overshadowed by the increasingly powerful fruity magnolia for me to figure out why. It’s definitely far more than mere cedar, to my nose. What’s even odder is that, around the 90-minute mark, there is a definite impression of yeasty dough circling around the edges of the perfume. Rousse smells a lot like highly perfumed, sweet dough with a floral-fruity, magnolia-linden twist, and just the faintest pinch of cinnamon, all atop a bitter, dry woods base. It’s actually pleasant — in fact, quite enjoyable in a strange way — but I can’t get past my confusion. I’ll be honest, if it wasn’t for the initial blast of Red Hot cinnamon candy in Rousse’s opening minutes, I would think I had a mislabeled perfume sample. Surrender to Chance doesn’t normally make those sorts of mistakes, but what I’m smelling on my arm really is nothing like what I had expected or read about. Where is the cinnamon? Why is this so damn floral? So many people say that Rousse is all about the cinnamon, but not on me. The only thing that really fits other people’s descriptions of the fragrance is Rousse’s dry, dusty murkiness in the background, which is something touched upon in Now Smell This‘ review of the scent. As time passes, Rousse gets creamier, softer, and sweeter. At the end of the second hour, it’s a beige swirl of velvety, fruity magnolia, with dribbles of honey and a pinch of dry spices atop some dry, “greige” woods. But, a bare thirty-minutes later, Rousse suddenly becomes a wholly abstract creamy fragrance that is infused with vanilla, amorphous white notes that only hint at something floral, and a nebulous sense of dry, cinnamon woods. Not long after, about 4.25 hours into the perfume’s development, Rousse is reduced primarily to a creamy, delicious, vanilla custard. There is still that woody, dry element barely flecked by dusty cinnamon, but it’s so muted as to feel quite intangible at times. And Rousse remains that way until its final moments, when it’s nothing more than an abstract, almost gourmand-like sweetness with a slightly vanillic undertone and the quietest whisper of dryness. All in all, Rousse lasted just under 6 hours on my skin, with a good portion of that time spent as a skin scent. On Fragrantica, a few people put Rousse’s longevity at around 5 hours, with one noting only 4 hours. The majority listed the sillage as “moderate,” with the next greatest number voting for “soft.” Clearly, it’s not a monster of either longevity or projection. I liked Rousse — once I put aside what I expected and just sat back for the creamy, floral ride. I’m not judging it for failing to live up to expectations, because skin chemistry is a wonky thing and I realise my experience was quite atypical. However, what I did smell didn’t knock my socks off, and I certainly don’t think it’s a very special fragrance, though it’s a perfectly pleasant scent that actually has some lovely moments. Still, for a fragrance that is so expensive and hard to access as a Paris Bell Jar exclusive, Rousse doesn’t seem worth either the time or money to obtain it. I get the sense that reviewers who did have the proper, full, cinnamon Rousse experience weren’t very blown away. It’s as clear as day that Bois de Jasmin wasn’t, finding Rousse “nice and pretty,” but bluntly calling it both “a disappointment” and a “let-down.” On Victoria, Rousse was initially “[l]ipstick and candied lady apples” with a powdery violet note; later, a woody note based on cedar whose “dense sweetness melts away in the heart of the composition, although the dry and somewhat cloying effect reminiscent of powdered sugar remains vivid.” In the drydown, Rousse was “delicate powdery notes tinged with cinnamon, violet and vetiver.” On second thought, she didn’t seem to have the typical Rousse cinnamon experience, either…. Another Lutens from the période bizarre: a mulled-wine accord made with clove and cinnamon mixed with an intense rooty-anisic (carrot-seed?) note, adding up to one fine mess. cinnamon is the star of the show here. The opening is lively and sweet, and reminiscent of cinnamon Red Hots (and if you like Red Hots, see also Comme des Garçons Harissa). The dry down is much drier and milder, and the cinnamon takes on first a dusty, later a creamy-powdery quality as it blends with dark woods, iris and whatever else is in there (the fruits and flowers are indistinct). There is a touch of amber and vanilla to keep it from being quite bone dry, and like yesterday’s Mandarine Mandarin, it has a kind of murky-dusky, not-quite-dark-not-quite-bright quality. I wouldn’t call it a transparent scent, but it is considerably less embellished than the “standard” Serge Lutens style, if such a thing exists. I would call it spare, even restrained, and it will not, like some in the line, continue to morph on your skin over a period of hours. Many reviewers so far seem to find it dull, but I have liked it more and more on each wearing — I like spare and restrained — and it is easily my favorite of the recent Serge Lutens releases. 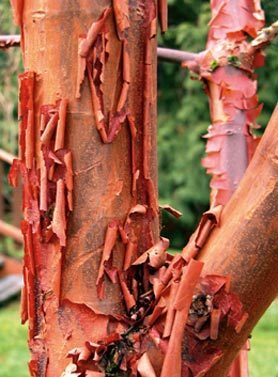 The smell of the spicy, powdery bark, of the resinous wood is all around you, like a warm cocoon. The top accord features a sweet, vaguely fruity and candied note (what I take to be mandarins), cinnamon and woods. As the scent progresses, it loses practically all of its initial sweetness and acquires a slightly powdery, slightly “buttery” violet note, as well as a brighter, spicier floral smell of carnation, which complements the cinnamon very nicely. The drydown is dark and balsamic, with plenty of amber and some vanilla to soften and round the composition. This is a melancholy, contemplative scent, an adult’s day-dream of an enchanted world. Like Leopoldo, I can’t help but notice the resemblance between the new Lutens fragrance and Idole de Lubin. In fact, for me, the two are rather too similar. I smell Idole in the spicy candiedness of the top notes of Rousse and in the resinous drydown. Rousse is woodier, drier, much less “boozy” and has a slight powdery undertone (the powder of the grated bark), but the two are still very alike, on my skin. Because of that, I can’t help but feel that I’ve been there, done that, got a bottle. On me, the Idole resemblance was brief and limited to the opening stage, while the rest of my experience was obviously completely different from all the reviews noted up above. Clearly, this is a fragrance that varies in how it manifests itself. It usually does not need to said that all perfume journeys depend on individual skin chemistry, but Rousse seems to trigger a wider disparity than most. Look at what people have detected: from my magnolia-linden, yeasty dough, and vanilla custard experience; to Bois de Jasmin’s powdery violets, cedar and vetiver; Luca Turin’s anise carrot-seed; NST’s Red Hot cinnamon candies; Perfume-Smellin’ Things carnations, violets, and Lubin’s Idole; and Perfume Posse’s apple pie, doughy crust, and more Idole! At least there is some consistency over at Fragrantica. 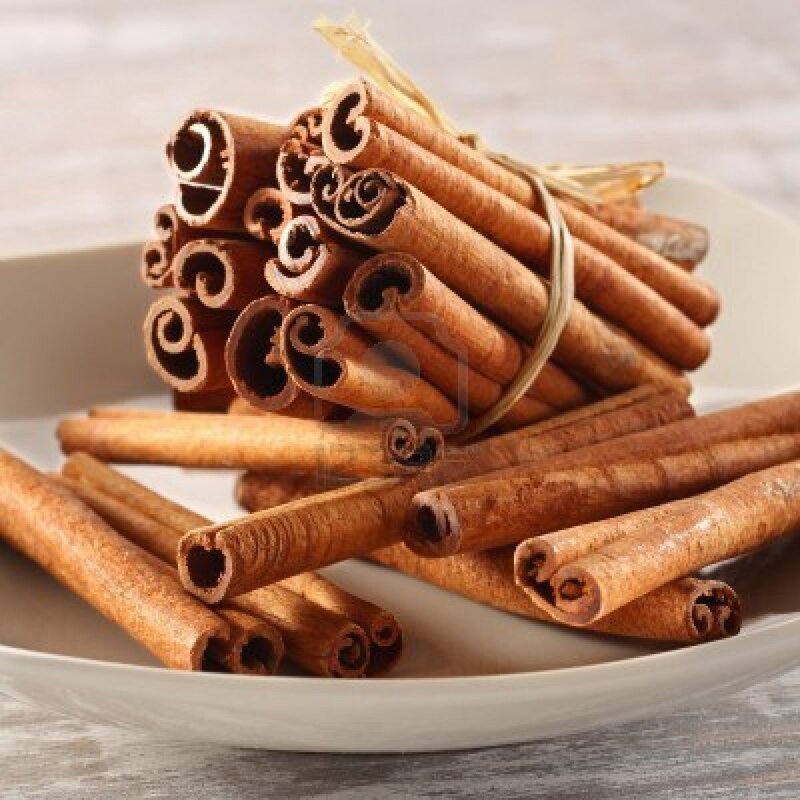 There, an overwhelming majority of the reviews talk about the cinnamon, and almost nothing but. However, even on Fragrantica, there are some sharply divergent experiences. One commentator talked about how Rousse was primarily a “soap cloud” on her skin, another said “it’s more cloves and amber than cinnamon resting on a sweet floral citrus bed,” and a third talked about how she experienced loads of orris butter and carnation. 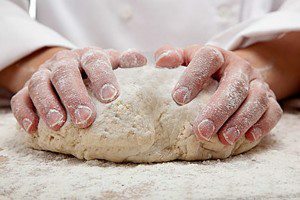 A handful mentioned a yeasty, doughy quality underlying the fragrance. A tiny portion talked about how the cloves were too overpowering and bitter for them, creating a medicinal start that turned them off the fragrance entirely. I don’t know whether to recommend Rousse to you, simply because I don’t know what notes will show up. As a whole, Rousse seems to be a dry, woody, cinnamon fragrance, but, clearly, there are some enormous exceptions to that rule. Still, if you adore cinnamon with a passion, it may be worth your while to get a sample and see what happens. Sizes, Cost, & Availability: Rousse is an eau de parfum that is part of the Serge Lutens “European Exclusives” line, which means it is available only in the larger 2.5 oz/75 ml Bell Jar size, though you can occasionally find the discontinued 50 ml bottle on rare occasions. Rousse retails for $300 or €140 for a 75 ml/2.5 oz bottle. 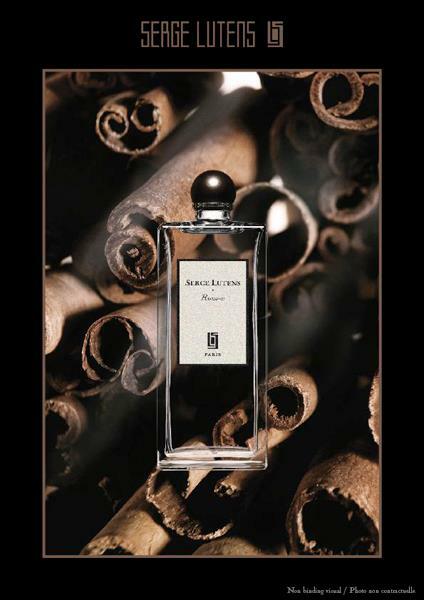 You can buy Rousse directly from the U.S. Serge Lutens website or from the International one. Discount Sales: I was initially overjoyed to find the cheaper, discontinued 1.7 oz/50 ml size bottle of Rousse available at Aedes for $120, but then I saw that it was out of stock and I doubt they’ll ever get more of it. However, I’m a little dogged and OCD in my hunts, so I found two vendors who sell Rousse in the cheaper, small, discontinued bottle. One is in Kuwait and seems to be a big perfume vendor called Universal Perfumes. It’s selling Rousse in the 1.7 oz bottle for $109.99 with $6.95 global shipping. Another is a U.S. site called Bay Perfumes who sells the 50 ml bottle for $98.40 with free domestic shipping on all orders over $85. So much better than $300, even if it is in a smaller size, no? Update: a reader of the blog, Alicia, sent me a link to a Spanish online perfume site called Parfumeria Sabina that is selling the 50 ml bottle of Rousse for €62.76, which is a fantastic price, and there seems to be free shipping, though I assume it’s only within the EU. Personal Shopper Options: If you really want the Bell Jar but at a cheaper price, Undina of Undina’s Looking Glass reminded me of Shop France Inc run by Suzan, a very reputable, extremely professional, personal shopper who has been used by a number of perfumistas. She will go to France, and buy you perfumes (and other luxury items like Hermès scarves, etc.) that are otherwise hard to find at a reasonable price. Shop France Inc. normally charges a 10% commission on top of the item’s price with 50% being required as a down payment. However, and this is significant, in the case of Lutens Bell Jars, the price is $225 instead. The amount reflects customs taxes that she pays each time, as well as a tiny, extra markup. It’s still cheaper than the $290 (not including tax) for the bell jar via Barney’s or the US Serge Lutens website. Another caveat, however, is that Suzan is limited to only 10 bell jars per trip, via an arrangement with the Lutens house. There is a wait-list for the bell jars, but she goes every 6-8 weeks, so it’s not a ridiculously huge wait, I don’t think. If you have specific questions about the purchase of Lutens bell jars, or anything else, you can contact her at shopfranceinc@yahoo.com. As a side note, I have no affiliation with her, and receive nothing as a result of mentioning her. Outside the US: In Europe, the price of Rousse is considerably cheaper at €140 from the French Lutens website or from their Paris boutique. Other language options are available, though the Euro price for the item won’t change. To the best of my knowledge, the Paris Exclusives are not carried by any department store anywhere, and the only place to get them outside of Barney’s New York boutique is the Paris Serge Lutens store at Les Palais Royal. Samples: You can order samples of Rousse from Surrender to Chance starting at $3.99 for a 1/2 ml vial. I actually ordered mine as part of a Four Piece Export Sampler Set (even though Rousse is actually a non-export fragrance), where you can choose 4 Lutens Regular Line fragrances for a starting price of $18.99 for a 1 ml vial (as opposed to the usual 1/2 ml starting size). This entry was posted in Fragrances, Orientals, Perfume Review, Serge Lutens and tagged Christopher Sheldrake, perfume review, Rousse, Rousse perfume, Rousse Perfume Review, Serge Lutens, Serge Lutens Rousse by Kafkaesque. Bookmark the permalink. Dear Kafka, wonderful review but in the end, the perfume sounds just blah. I don’t think I’ll be missing much if I take a pass. I am intrigued! I love reading your reviews, Kafka, as I can kind of feel like I am smelling it and feeling the fragrance develop and unfold with you. Thank you for the journey! Somehow, in all my visits to Barney’s, I have never smelled this. How strange! I wonder how it will be on me and if I will like it. It sounds like it has a lot that I do like (woods – even greige ones 🙂 – spice, vanilla custard), but it seems to lack the drama I love and want from an SL fragrance. Well, you never know. On the to-try list it goes! I think you put it well when you commented on the lack of drama. Rousse has none. I mean, when one of the *positive* reviews talks about how its dullness puts her to sleep, then…. 😀 But I’d be curious to see what you think when you try it, if only to see what you detect besides cinnamon. Another superb review and even though Rouse was eventually a ‘no sale’, your review certainly was. I have a growing collection of Serge Lutens and your reviews provide both a guide and a fragrance experience in themselves. Your imagery and descriptions keep me coming back for every new post. Bravo! Hurrah, you’re here! A huge welcome, two2ahorse! With regard to Rousse, I can’t say I’m particularly surprised by your reaction. It has nice bits, but still…. From what I know of your tastes already, I truly can’t imagine you wearing Rousse, no matter what sort of odd way it manifested itself. Apple pie, cinnamon, white florals, powdery violets… none of them seem very you. (I truly hope you didn’t get the apple pie that that one blogger did! LOL.) Not even the Idole sort of woodiness really seems like you either. And a very big thank you for your hugely kind words on the blog and my reviews. As soon as I saw cinnamon any interest in learning more about the perfume pretty much died. I don’t like cinnamon in anything, gum, mints, candles, etc. I can’t imagine that I would want to taint my body with it as well…no matter how nice and creamy the drydown is. You really have been put through the gauntlet with your Lutens week haven’t you!!! LOL at not wanting to “taint” your body with it. *grin* As for my Lutens week, I may have bitten off a little more than I could chew. But Fille en Aiguilles made a lot of it worthwhile. What a perfume! Instant love. Seriously, I need to get a full bottle — that’s how good it is. If you haven’t tried it, I urge you to because it’s really good and I think you’d love it in winter. Interesting perfume, I´m not a big fan of cinnamon, but I like perfumes that are diverse enough to manifest in a different way in other people, that would mean they are higher quality. Since I will be in Paris around October I may try to smell this or other Lutens fragrances. I’m going to make you a list when you go so you will know exactly what to try at Serge Lutens and what would suit you. He has over 50 fragrances, after all. LOL. I have a sample of this. I need to dig it out and try it again. I have very little recollection of it which I guess says something right there. 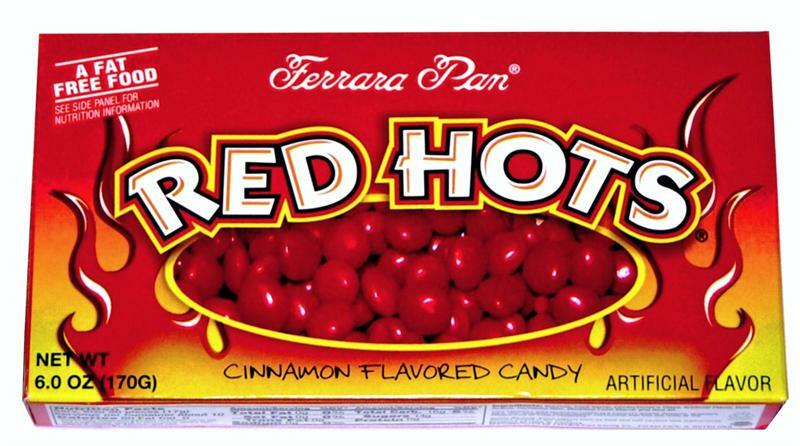 I absolutely LOVE cinnamon candy (cinnamon gummy bears, hot tamales, even red hots, fireballs, etc.) – but the more I read, the more this perfume sounds rather unappealing. Perhaps I’ll try it one day, perhaps not. Either way, sounds like I am not missing much. If you stumble across it, definitely try it, if only to see how it manifests itself on your skin. It seems to be an especially odd one in that way, given some of the accounts. But you’re not missing much if you never smell it….. I haven’t tried this one on skin and just can’t remember if I smelled it from the bottle… I must have since I was going through all bell jars but I have no recollection about it. And with your review – even though I enjoyed reading it – I don’t think I need to run looking for it. But I’ll sniff it one day when I get a chance – just to be thorough.